Three weeks vacation is a long vacation and we loved every moment of it. Well, maybe not getting bit by mosquitoes. If I’m thankful for anything about living in expensive Vancouver, I’m very thankful that there are no mosquitoes. Being bug-free, especially when camping for two out of three weeks, would have been miraculous. Highlights included driving the side roads in Quebec along the St. Lawrence, getting our feet mucky in the Bay of Fundy, driving the breath-takingly gorgeous Cabot Trail in Cape Breton, the fairy-tale village of Peggy’s Cove, picking up shells off the red sanded beaches of PEI, and visiting the strangely deserted but beautiful city of St. John, NB. I also fell in love with Montreal. Fell hard…and not just because of the poutine. It was exciting, relaxed, and perfect and I’m almost ready to pack my bags and relocate. French, do I really need to be that fluent? Honestly, it doesn’t seem so! I also loved the Vermont town of Montpelier. It was beautiful and had everything I could want in a small town…except that it’s not Canada. And as my friend Jason in Montreal beautifully put it, as long as you are in Canada, you are home. Oh, and the food! We ate some pretty wonderful meals and I even managed to discover a love of cucumbers, peaches, plums and I even tried scallops for the first time (but definitely not the last). And while it was fun trying new foods, eating at new restaurants and beach-side shacks, it also feels good to be in my own kitchen. 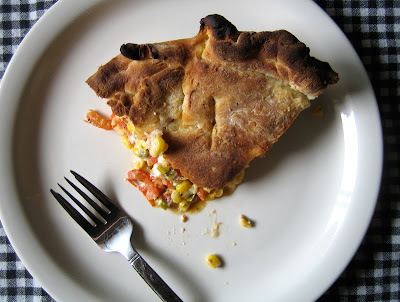 The first real meal I cooked when I returned was this pie. I had seen the recipe in my August copy of Gourmet magazine and it just looked perfect. Comforting and homey yet full of seasonal, fresh ingredients. It was the perfect meal to come home to. The beauty of this recipe is that it takes all the complicated pie-making stuff and throws it out the window. Instead of a tricky pie crust, this one uses biscuit dough which is so much easier to roll out into a round-ish shape. If I had some zucchini, I’d even toss in a layer of that for a pretty green, red and yellow pie. It seems like a forgiving dish. And it’s the perfect thing to make on a weeknight and it’s good enough to serve to guests for brunch. If you aren’t in your kitchen now cutting up your fragrant garden tomatoes or gently stirring up a batch of biscuits, you are clearly in the wrong. This meal must be made. Now. Get to it, I’ll be waiting. 1. Preheat oven to 400 degrees. Mix up your biscuit dough and divide the dough in half. 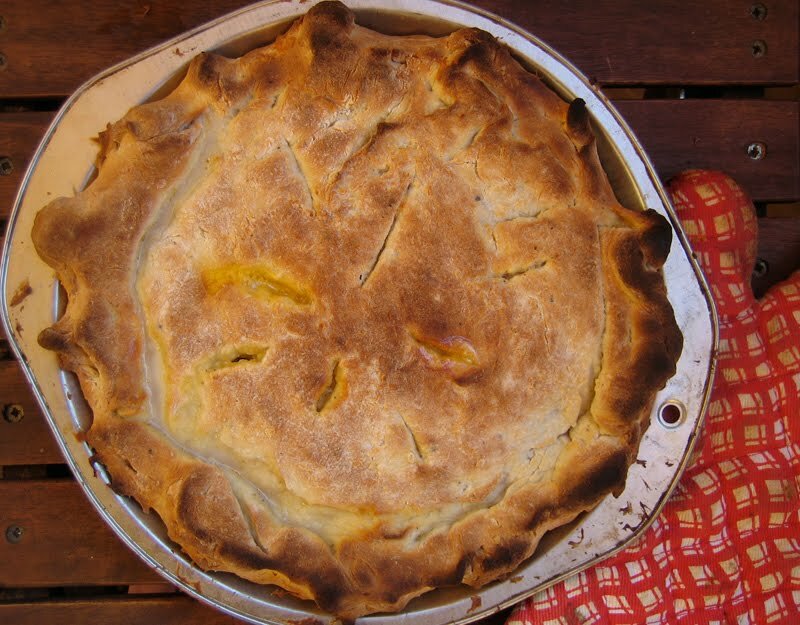 Roll out one ball of dough into a circular shape and line it into a pie plate. 2. In the meantime, mix together the mayo with the lemon zest and juice and set aside. 3. Layer in half of the tomatoes to line the bottom and sprinkle with half of the fresh basil. Grind some black pepper over it all and a small pinch of kosher salt. Add half the corn and half the green onions and drizzle over half of the mayo mixture. Repeat. Sprinkle the top of the pie with cheddar cheese. 4. Roll out the remaining ball of dough and top the pie with it. Seal the edges and make it look pretty like Martha would (or be like me, cross your fingers and just try your best). Cut in a few vents to let the steam escape and brush the top with a bit of egg wash, milk or melted butter. Put in the oven to bake for about 30 minutes until the filling is bubbling and the top is golden. Remove from oven and serve. I just love all the recipes you make. Always look forward to the next creation. Your vacation sounds fabulous – one of these days I'll find out what that's like. This pie looks fabulous, like all your recipes! This looks delicious and makes use of all of the best flavors of the summer! Your vacation sounds wonderful. While you were in Montpelier did you visit Gesine Bullock-Prado's bakery? So very happy to have you back on here, although I quite did enjoy your creative ghost posts! The photos of your trip look awesome as does the food you enjoyed while there. Note to self: must try to make it out to the East coast soon! It looks gorgeous! My only trip this summer was a three day trip to Texas to pick up my pooch. It was hotter than a jalapeno down there but we survived and am glad to say that Mr. Dexter is all settled in and enjoying his new Canadian citizenship. I love pie…sweet or savoury and I will be making this as soon as the raspberry rhubarb pie I picked up yesterday from St. Jacobs Farmer's Market has been devoured! This looks great – I will definitely be making it! Thanks! I've had my eye on that pie for a month or more and it's time to make it! So glad you had such a good (and long!) vacation. I hear you on the mosquitoes. We are so lucky here in the Northwest to not have to deal with those or most other bugs besides spiders. OOOH – that os a gorgeous pie, and I love that it's so unfussy! I also love Montreal — I don't speak a word of French (well, except for food words, of course… 🙂 but still found it to be such a welcoming place. Great food, lovely people, beautiful city. So glad you enjoyed it!! Glad you enjoyed your vacation! =) I saw this first on Smitten Kitchen and knew I had to make it but now I've also seen it on another blog and your blog so it makes me even more excited to try it! I'm going to make it this week. oh you know I am totally making this. Ooo, definitely making this! I've only travelled as far as Alberta (in regards to travelling Canada), but I would love to take a long, leisurely road trip across this wonderful country. That looks fantastic, and how great to have another dish for the farmers market produce. Glad you had a good trip, but I'm glad to see you back, too! Welcome back! I'm dying to visit Montreal someday. Jealous. And I know what you mean about missing your kitchen. Eating out is fun, but it gets old quick for me. This does look like a perfect welcome home pie. So glad you had a grand vacation and got home safe and sound. Just want to let you know that I love reading your blog, because you cook the way I like to (though with more regular success!) I like using recipes to get inspired and salivating… but enjoy the rush of free wheelin it and actually (sometimes) creating something beyond tasty. so thanks! ps. go bay of fundy mud! oooo it sounds like such a wonderful vacation!!! Gwen, I think it does! Thanks so much Madame, ditto what I said above! Glad to see you've got sherbet crazy, it's so easy!! Joanne, I didn't visit the bakery. I should have, as I love a good baked good. Thanks Bijoux, it's good to be back. Happy to hear that your pooch is adjusting well! Dana, it was such a great pie to come home to. Amanda, it's a wonderful meal, I hope you do try it out. It is indeed quite unfussy, Cookie pie, which is half of it's charm. I hope you love it, eatme! It's good to be back, Leftoverist. Yes, get yourself to Montreal, it's beautiful. Haha, thanks Hillary. Glad to know that the freewheelin' spirit is alive and well in the kitchen. looks delish! i love the liberally adapted, mine are usually like that too! Made this pie last night with amazing fresh Georgia Corn and Vine tomatoes… awesome! I also used the Biscuit Recipe and left its pretty much AS-IS and it was DELISH—> The only thing i would change NEXT time (yes, there will be a next time this dish is awesome) is i would cut down on the Lemon. It just OVERPOWERED the dish and it was hard to get past it, I wanted to taste more the fresh veggies but the lemon was a little overpowering. Thanks for the site, I am a regular visitor and now a regular in the kitchen too!!! I made the vegetable filling of this recipe, but put it into a filo pastry envelope. Yummy good. 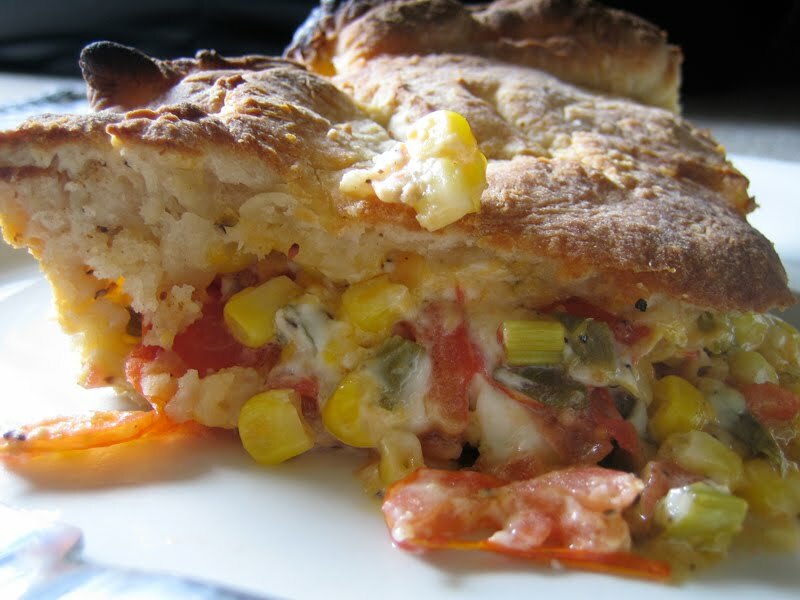 The vegetable filling looks to die for, as does the crust. I am dying to make this asap. Great flavor combinations and great photography. Paperhill, I'm convinced that is the only way to go. French, in phyllo? Sounds great! Glad you enjoyed it. Haha, I won't anytime soon, Lyndsay!